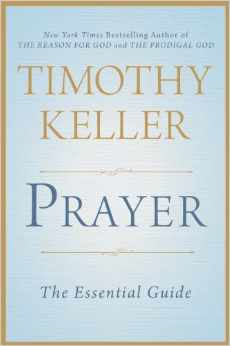 Tim Keller’s next book will be Prayer: The Essential Guide, which will be released November 4. And speaking of Tim Keller, he is the series editor of the new Cultural Renewal series. An upcoming book of interest is The Stories We Tell: How TV and Movies Long for and Echo the Truth. Author Mike Cosper shows how modern entertainment reveals humanity’s universal longing for redemption as he explores a variety of genres, influential films, and shows, ultimately teaching us how to engage with and evaluate what we watch. The book releases August 31. The Northampton Press, the ministry of our friend Dr. Don Kistler, is making available a collection of sermons by the great Charles Spurgeon in e-book format. These sermons are all from the Song of Solomon, and are titled “The Fairest of Ten Thousand.” For the time being it is only available as an e-book. It is available now on Amazon and soon on Barnes and Noble and Kobo. Categories: Uncategorized | Tags: book reviews, Christ and culture, Christianity and Culture, Coram Deo, Covenant Theological Seminary, movie reviews, music reviews | Permalink. Michael Card Weekend Conference and Concert in One Month! 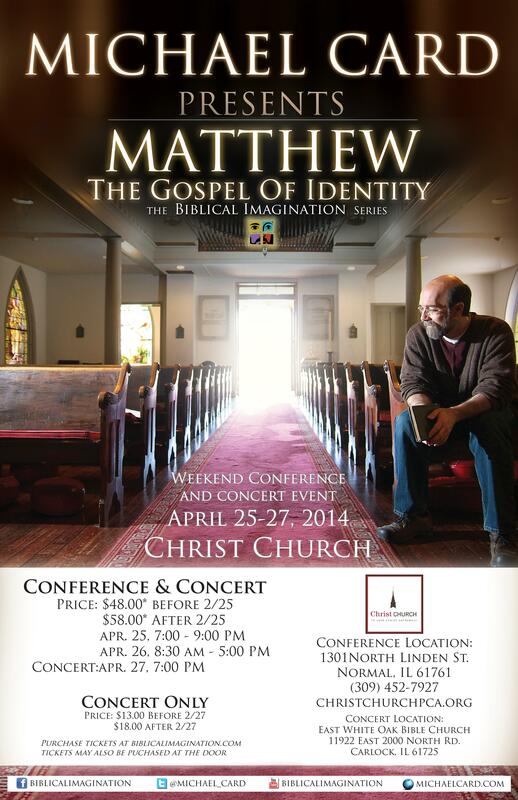 Christ Church, PCA in Normal, IL and East White Oak Bible Church are pleased to welcome back singer/songwriter, Bible teacher and author Michael Card for the Biblical Imagination Conference Matthew: The Gospel of Identity on April 25-26 and concert on April 27. The conference will be held at Christ Church and the concert at East White Oak Bible Church. For over thirty years, Michael Card has endeavored to engage with the text of Scripture, whether through the writing of music, books, or in the context of the conference or classroom. The fruit of this approach is heard in well-known songs like “El Shaddai,” “Immanuel,” and more recently, “Come Lift Up Your Sorrows.” Through the course of releasing over thirty albums, twenty-two books, and performing countless concerts, he has invited listeners and readers to honestly wrestle with the Bible, seeking to grasp the meaning of the text with all their heart and mind. A graduate of Western Kentucky University, Michael received his Bachelor’s and Master’s degrees in Biblical Studies. While at WKU, he met Dr. William Lane, who mentored him in an imaginative approach to studying the Bible. Michael went on to receive honorary PhD’s in Music and Christian Education from Whitfield Seminary and Philadelphia Biblical University. Michael lives in Franklin, Tennessee, where, with a group of close friends, he pursues racial reconciliation and neighborhood renewal. He and his wife, Susan, have four children. The Biblical Imagination Conference is made up of four elements: commentary, music, on-site experience and community discussion. 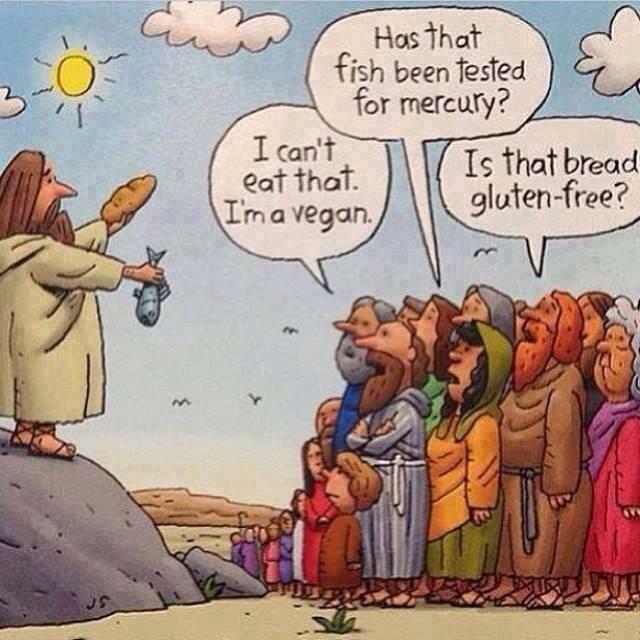 But what does biblical imagination look like, you ask? How do we apply facts in our heads to aches in our hearts? What is missing in our understanding that leads to a more biblical response to the Spirit of God? Join us as we seek to reacquaint, inspire, and shape the Church with the life of Jesus imaginatively seen through the Scriptures. 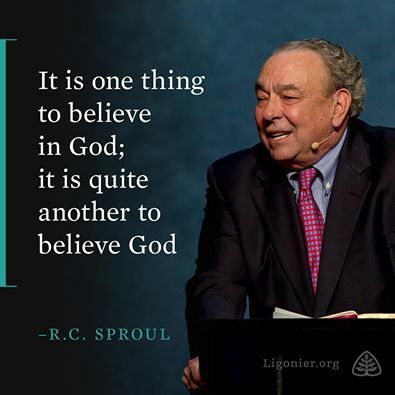 If you have any questions, or need additional information, please go to the conference site at: http://www.michaelcard.com/#/biblical-imagination/conference-dates or contact Bill Pence at (309) 452-5438 or bntpence@msn.com. The Biblical Imagination Series on the Gospels is almost complete. CDs and books are completed and in distribution on Luke, Mark and Matthew. Currently the John book is being edited by the great folks at Intervarsity Press and I am just finishing up the songs. It has been a long haul and it will be so rewarding to see them all together in a row. By the way, the video series from Israel produced by Day of Discovery is complete and available at our website. The concept with the Biblical Imagination Series is that you can go as deep as you choose to go. If you enjoy the music in light of your study of one of the Gospels, that’s great. But if you want to go deeper you can read the book or watch the video. If you want to go further still you can come to one of our weekend seminars which take place all over the country, indeed in many foreign countries. If you want to take a final step with the BI material you can choose to go to Israel with us in January. 2015. My dream has always been to walk with you as long as you feel called to dig. One of the wonderments of Scripture is that you can invest your lifetime in study and still only scratch the surface. Virtually everything I am doing now comes under the banner of BI. The only exceptions are fund raisers and private concerts. VOLUNTEERS, HELPERS AND BAKERS NEEDED! On Saturday we would like to provide the Conference attendees with snacks during the morning and afternoon breaks. We have lots of needs and hope you can help provide some of these items.Unless otherwise indicated, bring food items to the kitchen at Christ Church no later than 9:00 am on Saturday, April 26. Categories: Music & Concert Reviews and News | Tags: Biblical Imagination, Michael Card | Permalink. 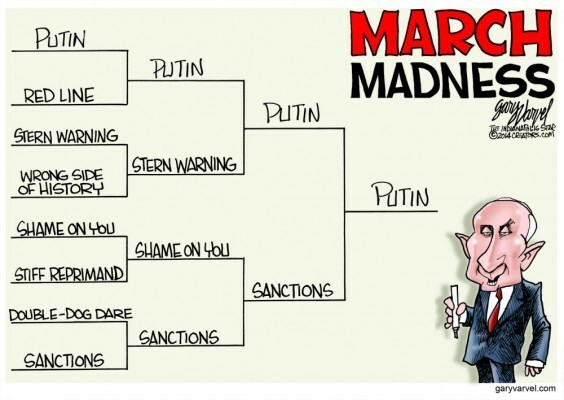 Cartoon courtesy of World Magazine. The Reformation Study Bible is undergoing a major revision/updating. It should be completed within the next year and will be available in the English Standard Version (ESV) and the New King James Version (NKJV). All Tim Challies all the Time! Christian hip-hop/rap artist Trip Lee was back in the studio in late February recording his follow-up to his 2012 record The Good Life. As Jars of Clay continues to celebrate their 20th anniversary, they have plans to record a new album of acoustic versions of their most popular songs. They are launching a PledgeMusic project today and need YOUR HELP to pick the Top 20 Jars of Clay songs for them to record acoustically. The new Jars 20 album will come out in the fall but they need your help today….so they know what to record! Plus, 10% of the proceeds generated from the project will go to Blood: Water Mission. Reach Records continues its flow of exciting Christian hip-hop/rap with Below Paradise from Tedashii on May 27. The album from Passion 2014, Passion – Take It All will be released April 29. We recently attended Ligonier Ministries National Conference in Orlando, something we have been blessed to do almost every year since 1997. It was a bit dicey getting out of town as we left in a snowstorm, with the plane having to be de-iced twice before we left. Once we got down there we had a great time with our friends Don and Angela Lusk, who were attending the conference for the first time. R.C. 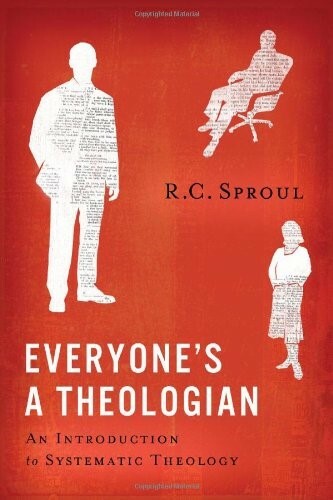 Sproul released his new book on systemat ic theology Everyone’s a Theologian at the conference – the book sold out the first day! 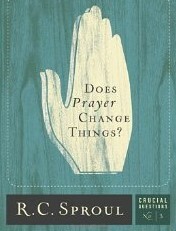 This is a fantastic book; look for a review soon. 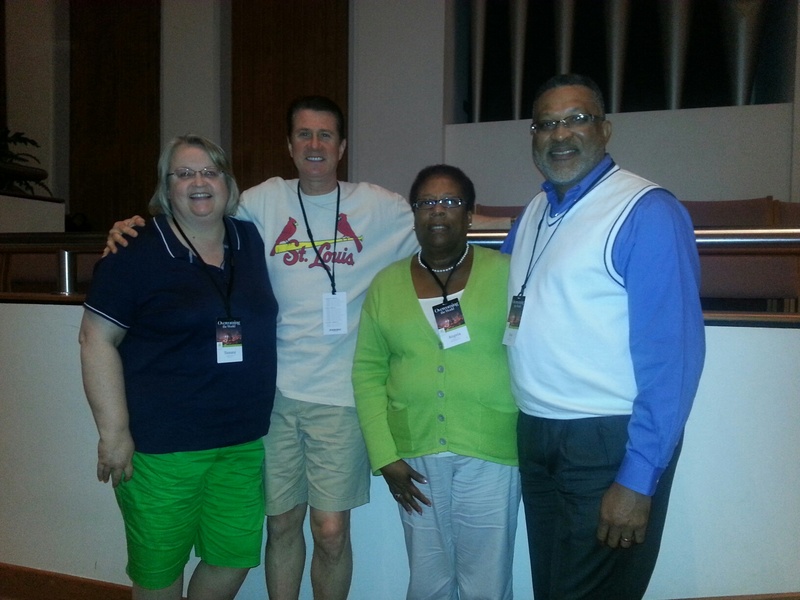 The conference was again held at First Baptist Church in Orlando. The church will be going through a building/renovation program next year and will not be available for the 2015 conference. The 2015 Ligonier National Conference will be held February 19-21, 2015 at Disney’s Coronado Springs Resort. 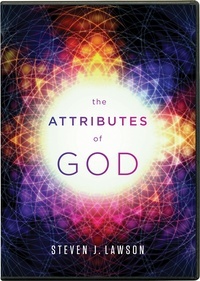 Categories: Uncategorized | Tags: book reviews, Christ and culture, Christianity and Culture, Coram Deo, leadership, Ligonier, movie reviews, music reviews | Permalink. What do you do when the power goes out? 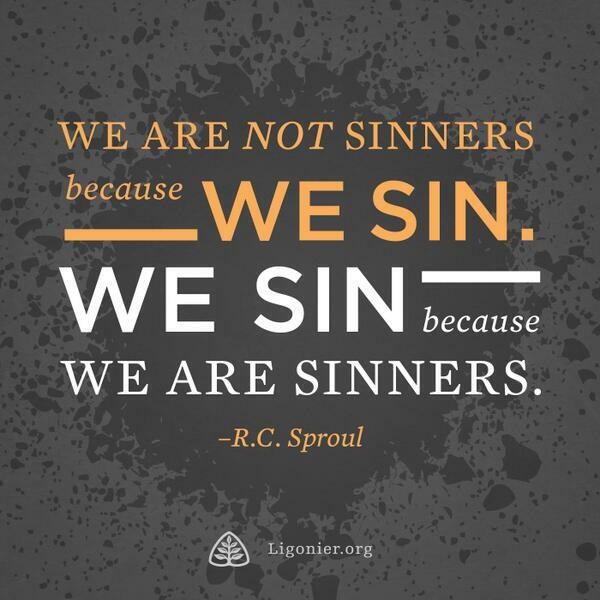 Keep preaching Christ. Recently at the Shepherds’ Conference in Los Angeles held at Grace Church, mid sermon the power went out. The place went black with only emergency lights dimly shining in the cavernous brick auditorium. What did John MacArthur do? He grabbed a flashlight and just kept on preaching. He didn’t flinch. He was unflappable. He literally just kept going. 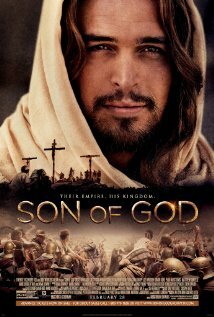 His voice grew with intensity as he unpacked the covenant of redemption. Soon his voice was traveling powerfully to every corner of the room. Dr. MacArthur just went on preaching Christ. In Spurgeon fashion he powerfully pleaded with pastors to preach Christ or stop preaching. 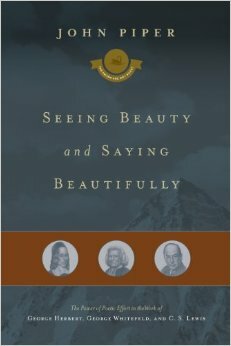 John Piper’s new book Seeing Beauty and Saying Beautifully: The Power of Poetic Effort in the Work of George Herbert, George Whitefield, and C. S. Lewis, the sixth book in the The Swans Are Not Silent series, will be released May 31. The God Girl Bible and God Guy Bible, now available in the ESV translation, are devotional Bibles geared especially for teens (or some preteens). Hayley and Michael DiMarco, authors of several bestselling books for young men and women, have packed these Bibles with devotionals and book introductions alongside the Bible text. Both editions also include special prayers, a subject index, reading plans, a glossary of key words, and character profiles of men and women in the Bible. 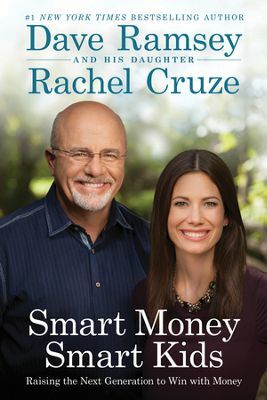 Dave Ramsey will release Smart Money Smart Kids: Raising the Next Generation to Win with Money, written with his daughter Rachel Cruze, on April 22. Popular Mitford series author Jan Karon returns with a new novel on September 2: Somewhere Safe with Somebody Good. Here’s a description of the book: After five hectic years of retirement from Lord’s Chapel, Father Tim Kavanagh returns with his wife, Cynthia, from a so-called pleasure trip to the land of his Irish ancestors. While glad to be at home in Mitford, something is definitely missing: a pulpit. But when he’s offered one, he decides he doesn’t want it. Maybe he’s lost his passion. His adopted son, Dooley, wrestles with his own passion—for the beautiful and gifted Lace Turner, and his vision to become a successful country vet. Dooley’s brother, Sammy, still enraged by his mother’s abandonment, destroys one of Father Tim’s prized possessions. And Hope Murphy, owner of Happy Endings bookstore, struggles with the potential loss of her unborn child and her hard-won business. Millions of fans will applaud the chance to spend time, once more, in the often comic and utterly human presence of Jan Karon’s characters. Indeed, they have never been more sympathetic, bighearted, and engaging. 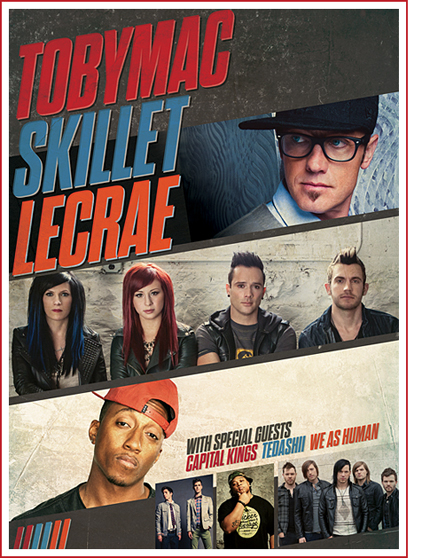 tobyMac, Skillet, Lecrae, Capital Kings, Tedashii and We As Human will bring the Summer Shed Tour to St. Louis May 9 at the Verizon Wireless Amphitheatre for a 6:00 pm concert. 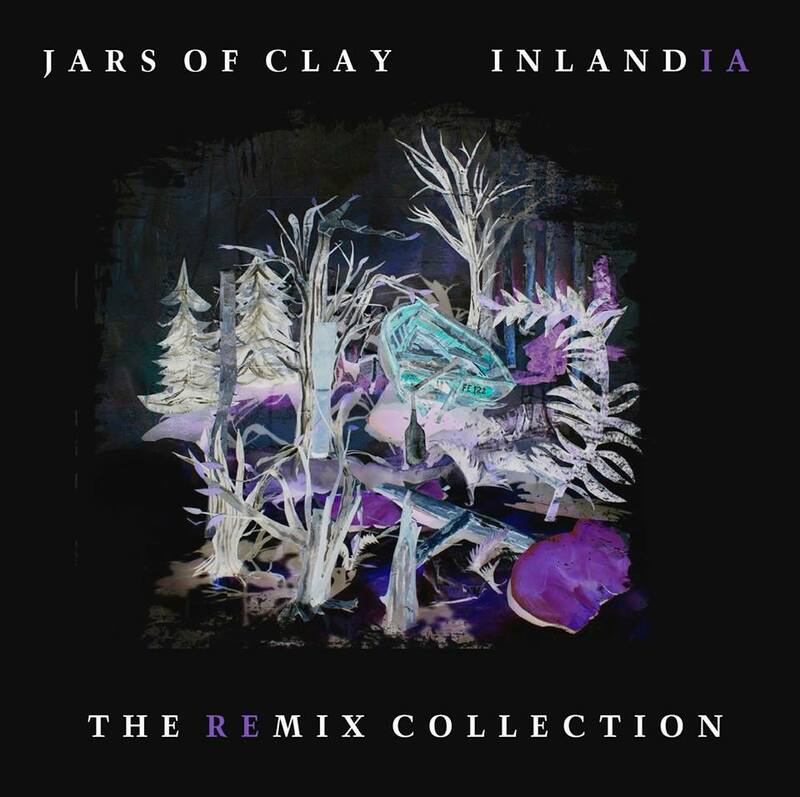 Jars of Clay will release Inlandia, the remix project March 4. Inland was one of my top albums of 2013. 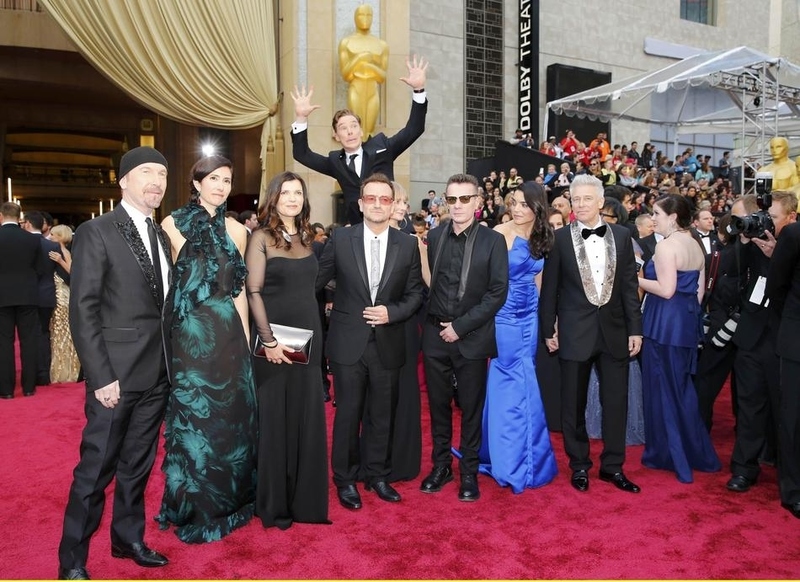 And speaking of U2 and the Oscars, here is Benedict Cumberbatch (among other things, the voice of the dragon in The Hobbit), photobombing U2 on the red carpet at the Oscars. New to the Leadership Library – The Seven Habits of Highly Effective People by Stephen R. Covey. Fifteenth Anniversary Edition. 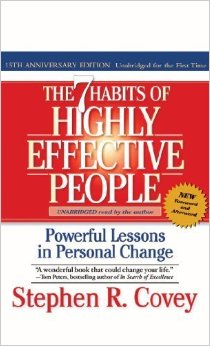 Audiobook read by Stephen R. Covey. 2004. Categories: Uncategorized | Tags: book reviews, Christ and culture, Christianity and Culture, Coram Deo, John Piper, leadership, movie reviews, music reviews | Permalink.